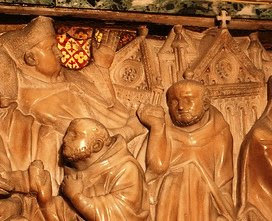 Detail from the Tomb of St. Dominic- The Vision of Pope Innocent: St. Dominic holds up the Lateran Baslica . Detail to the right. Once when the servant of God, Dominic, was at Rome in the Basilica of St. Peter, where he was praying fervently in God's sight for the preservation and growth of his Order, which the right hand of God had raised up through him, he saw the glorious princes, Peter and Paul, coming toward him in a sudden vision wrought by the power of God. Peter, who was first, seemed to be handing him a staff, and Paul a book. Then they spoke these words: "Go and preach, because you have been chosen by God for this work." And then, in a moment of time, he seemed to see all his children dispersed through the world and going two by two preaching the word of God to the people. Later, Pope Innocent III when hesitating to give approval to this new Order, had a vision or a dream of St. Dominic holding up the Lateran Basilica (the official Basilica of the Pope). This vision is also attributed to St. Francis and is more commonly known. In any event, statues of these 2 great saints take their place on either side of St. Peter's Square! Wherever he travelled St. Dominic, called another St. Paul, carried with him the Gospel of St. Matthew and the Epistles of St. Paul. This was before pocket editions! And whenever St. Dominic travelled he walked! 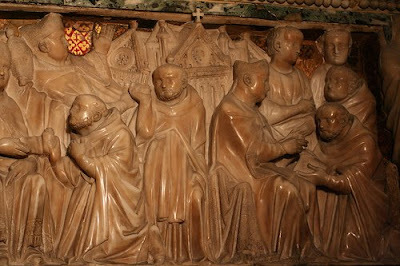 Thus, we can see how important these Scriptures were to St. Dominic. Man the sons and daughters of St. Dominic never lose their zeal in imitating this great apostle to the Gentiles! The Pauline Year Gives Us A New Novice!